Watching Bank of England Governor Mark Carney joust again with Jacob Rees-Mogg MP at the UK’s Treasury Select Committee yesterday got me looking back to the May press conference when Carney launched his warnings about the riskiness of voting Leave, that were then repeated at the May Treasury Select Committee hearings. There was a lot going on at the time but Carney had a secret weapon, a new monetary policy tool whose importance is still being overlooked. The intensity of the debate over Brexit was terrific during May and June. The Bank of England was clear that there could be financial chaos and a technical recession. There was only downside risk from the voting Leave. In that view the BoE was amplifying, but with authority, the typical consensus expert view. It took sides with the Cameron/Osborne government, clearly and simply, loyally. Remain supporters amongst journalists and politicians were very pleased. Leave supporters were not. Rees-Mogg was entirely right to question the independence of the bank. If Carney had talked in any remotely balanced way about the potential benefits of Leave then he would have been fair but as Rees-Mogg noted, he didn’t take up that opportunity. All serious people agreed Brexit would be a disaster, and Carney is a very serious person indeed. However, the sub-text was also crystal clear. And FX markets, a prime window onto, and channel of, monetary policy very much got the message. If the UK voted Leave then all the monetary policy power of the Bank of England would be brought to bear immediately to offset any shock to demand, due to fears about the supply side. Once it was clear that the UK had voted Leave then the markets immediately knew what to expect from UK monetary policy. Potential rate cuts, QE and other liquidity schemes – plus the bonus of a dramatic and statesmanlike broadcast from Carney himself. Sterling fell 10% in response to the u-turn in monetary policy, UK domestic equities fell in response to demand shock fears caused by long-run supply side fears. Political turmoil didn’t help much either. But, it wasn’t a disaster. Financial institutions sailed through unscathed, many even profitably. There was no repeat of Lehman. In the hearing yesterday Carney was not exactly smug, but he did say he was “serene” about the new stance. He also elaborated about just how profound the 180-degree u turn on monetary policy had been. He said monetary policy was on a tightening bias as late as May/June, and the next moves in rates were due to be up. That had all changed now and he clearly was a much happier man as a result. His incorrect monetary policy stance of the previous year and a half was now just a distant memory, “ancient history” as he called it. While the vote to leave was a shock a bigger shock, a monetary shock, would have been if the Bank of England hadn’t intervened to offset the uncertainty shock. If it had decided to defend the currency with a monetary tightening, that would have been truly disastrous. Some central bankers have made that mistake in the past and it never ends well. If it had appeared to stand pat and just keep its tightening bias, that would still have been a shock. Some central bankers have done that too, and it didn’t end well. The BoE had primed markets that it would respond appropriately and it did. GBP immediately fell 10%, and then rates were cut and QE was expanded. Osborne’s replacement, Philip Hammond, also made it very clear that the response to the Brexit shock was monetary, not fiscal. The BoE even said it would also tolerate an above target inflation rate – all in order to ensure financial stability and a return of inflation to 2% in the longer term. That “even ” is subtle, but very powerful. Why did Carney never say during 2015 that it would tolerate a period of above target inflation in order to bring current inflation up to target. Well, the obvious answer is because the BoE took its own projections seriously, and they showed inflation returning to 2%. Those projections always showing this happening kept monetary policy tight, with promises of more tightening to come if those projections showed an overshoot. The fact that this stance meant constant under-shooting was lost on the BoE. Is this a new tool? After the Brexit vote the UK central bank seems to have added this new weapon to its toolbox: Toleration of projected overshoots to its inflation target at a time when actual inflation is stubbornly below target. The BoE tolerated current inflation above target when it was above target, but what else could it do? It was a fact, but was it a choice too? We don’t really know. We do know that it wouldn’t tolerate inflation projections going above its target until we had the vote to leave, now we do. Perhaps this new tool could also be used by other central banks. Temporary overshoots of projected inflation in order to get current inflation up to target. Are you listening at the Fed, ECB and BoJ? And that someone is in far-away Australia, a country that has avoided recession for a quarter century. Things started going wrong for the past few years, when it ignored its NGDP level target and started worrying about home prices. If you had told Australians 10 years ago that official interest rates would fall to 1.5 per cent, many would have jumped for joy. Aside from homeowners, Australians are not feeling much joy these days. This is despite the lowest interest rates in 70 years, low inflation, economic growth close to normal and the unemployment rate – though not ideal – still lower than it was during the Sydney Olympics. So why are we feeling so miserable? The reason is that most Australians’ incomes are going nowhere. Wages are growing at recessionary levels, profits for small and medium-sized businesses are flat and the budget deficit constrains government spending. Overall, Australia’s “nominal” growth rate – the growth in actual money in our pockets – has fallen from 7 per cent per annum in the decade before the GFC to only 2 per cent today. A large part of it is also due to the out-of-date inflation target that the Reserve Bank of Australia has been tasked with hitting. A better option would be for the RBA to target a reasonable rate of growth in Australia’s nominal GDP. In other words, we should replace the RBA’s existing inflation target with a nominal GDP target. Stronger growth in nominal GDP would provide workers and businesses with greater means to pay their debts, hire more staff and invest in new plant and equipment. We all know the minimum wage is bad. Whenever a national, state or local government raises the minimum wage, there is a justified Niagara of negative commentary from mainstream economists, who correctly (if histrionically) point out that employment must be reduced to accomplish the goal of a higher and artificial minimum wage. Yet there is also wide and general assent among macroeconomists that the U.S. Federal Reserve Board cannot let the unemployment rate sink too low. We are informed the current official unemployment rate of 5% is treacherous territory, and dangerously pushing our inflationary luck. The Phillips Curve and all that, leading to Sodom, Gomorrah and Zimbabwe. So we have this: The Fed as a matter of explicit policy must ensure that at least one in twenty Americans who want to work is instead jobless and job-hunting, and the minimum wage should be scuttled ASAP. Really, is this supposed to be an appealing pair of policies for anybody who is an employee (the vast majority of Americans, that is)? Sad to say, the craft of macroeconomics in academia and punditry remains steeped in class bias, not liberal bias. At any moment, macroeconomists are thundering against the minimum wage, and the Fed is accused of feckless money-printing. Yet rarely (if ever) do macroeconomists rant against property zoning (including housing and retail stipulations), or the ubiquitous criminalization of push-cart vending. Deregulating property and push-cart vending would open up millions of low-barrier-to-entry business opportunities of the type average people could fulfill—ordinary retailing, Push a cart and sell clothes, small electronic goods, food, handicrafts, CDs, and so on. Whatever consumers and the market wants. To be sure, unzoning property and decriminalizing street-vending are not everyday topics in the mainstream macroeconomics profession. In fact, research in these areas is scant at best, and commentary nil. But bashing the minimum wage is of evergreen, compelling interest. Get out the megaphones. PS MM´s are right: The Fed should not target unemployment, or inflation. The Fed should target nominal GDP growth, and a healthy dollop of it every year. Government, in general, should tax and regulate as lightly as possible. But “lightly as possible” also means the most minimal regulations possible on property use and push-cart vending. What´s the good having weapons & ammo if you don´t have a target to aim at? Have central bankers run out of ammunition in their battle against deflation and unemployment? The answer, many policymakers and economists writing for Project Syndicate agree, is clearly No. “Monetary policymakers have plenty of weapons and an endless supply of ammunition at their disposal,” says Mojmír Hampl, Vice-Governor of the Czech National Bank. The real issue is not whether more powerful monetary instruments are still available, but whether using them is necessary – or even threatens to do more harm than good. And he goes on to consider all the different “calibers” of ammo Central Banks have at their disposal, from interest rates, including the negative variety, QE and Helicopter Money (HM), not forgetting the fiscal help that could be extended by the Treasury Departments. But what is the use of having “weapons & ammo”, be it QE, negative rates or HM, if there is no goal or target to “point and shoot” at? In other words, if you don´t have a goal or target, i.e. a destination, how can you “steer” the economy? 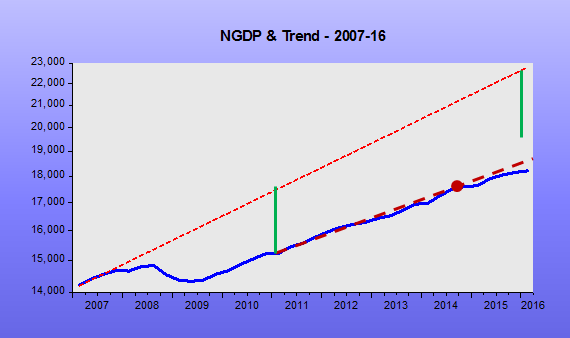 For the 1990 – 2007 period, the Fed managed to keep NGDP growing quite close to a trend level path. Maybe that was the implicit target. There were misses, sure, but they tended to be corrected and were nothing that compares to what happened in 2008. Throwing the economy into a recession that became “great” and quickly turned into another (or ‘lesser’) depression was, I believe, the work of extremely bad monetary policy that had become “fanatically concerned” with headline inflation. All the “ammo”, or “strategies”, adopted and ‘talked about’ have succeeded only in keeping NGDP growing at a rate below the previous trend and have not made any attempt to get NGDP closer to the previous trend level. But that would only be possible if the Fed had an explicit NGDP level target. Since mid-2014, in fact, it appears that NGDP growth is falling even further behind, which is consistent with the tightening bias the FOMC has shown since the end of QE3 was in sight. The target the Fed has, the 2% IT, has not only lost credibility but mostly works to constrain any attempt that might be made to get spending up, because the “2% target cannot be breached”! Of course we welcomed Mr Draghi’s willingness to ease monetary policy announced with at the January ECB meeting last week. And we recognised the positve impact on markets and therefore on NGDP expectations. But was this just a stopgap response to a poorer negative trend? The fight over the direction of US monetary policy between the Fed and the markets will continue to dominate the news. The fight within the ECB will also continue, weakening the credibility of Mr Draghi’s easing bias and the current QE efforts. We think he should open a new front against the hawks by starting a discussion of the inflation target itself, the biggest barrier to optimal monetary policy in the Euro Area. Wolfgang Munchau is right to despair after reading the minutes of the December 2015 ECB meeting. The ECB has got itself into an extraordinarily difficult position. It has missed its policy target — a headline rate of inflation at “close to but below” two per cent — for four years. The target has lost credibility. Once people have lost confidence in an inflation target, it becomes very hard for the central bank to persuade them to trust the target again. It was touching to hear Mr Draghi last Thursday talk about failing to reach a goal, then to try again and to fail again. I do not doubt his determination but the minutes of the December 3 meeting of the governing council tell us that not everybody supports the target in the same way. The minutes are anonymous. We know what has been said but not by whom. What struck me in particular were two specific arguments used by some of the governors against a further increase in the size of asset purchases — part of the programme of quantitative easing aimed at revitalising the eurozone economy. One said that he would not accept a further increase in QE unless the eurozone was once again in deflation. The implicit message of that statement is that this particular governor’s policy target must be zero per cent, not two per cent. He will only act once prices actually fall. Another argument was that the positive effects of QE were diminishing over time while the negative side effects, like potential financial instability, were not. This argument is clever but also inconsistent with the policy goal. It is clever in the sense that it is self-fulfilling: if you choose not to increase the level of QE, then its effects diminish over time. And, of course, when the policy is not working, the adverse side effects may dominate. However, what is infinitely more depressing in the minutes, and so sad too Munchau does not mention it, is the constant reference to the “close to, but below, 2%” inflation target. Expectations are almost everything in life, QE is fine but only as a tool to achieve a target. 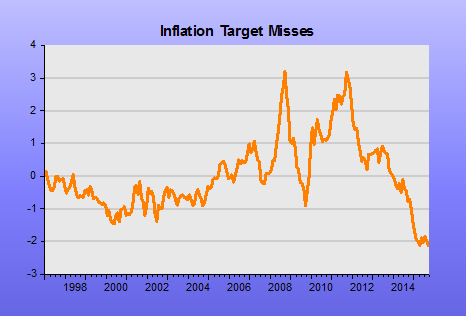 This inflation target undoes a huge part of the QE and general easing bias. Markets and economic actors know the ECB will tighten if inflation really does start to approach even 1.5% let alone 2%. Such tightening would then crush economic activity just as it did in in the Euro Area in 2008 and 2011. European mainstream economists seem to think the ECB has a flexible target. But do these economists read the minutes of the policy-making body? It seems not. Although we were encouraged by the near non-mention of the inflation ceiling target in the recent January ECB press conference, it’s dead hand still appeared, if very late in the statement, chilling all it touches. Third quarter Euro Area economic growth was modestly encouraging. Signs are that 4Q will continue this trend, although monthly consumer inflation looks too weak for comfort. While many fret about headwinds from the China slowdown or US monetary tightening, the biggest headwind to Euro Area growth remains the inflation ceiling. Even if the Germans seem more inflation-phobic than ever, it would be nice to see some on the ECB open up a discussion about changing to a formally flexible inflation target, if not NGDP target like some Europeans have proposed. The Chief Economist and Executive Director, Monetary Analysis and Statistics, at the Bank of England and Head of the Economics Department gave a long speech at the Trades Union Conference last week. It was certainly long on statistics but, as usual, with Andy Haldane largely empty of any monetary analysis. There was a lot of very interesting “on the one hand this/on the other hand that” chat about the relationship between technology and labour, with lots of colourful charts using his statistics department to the utmost. That said, as with most macro-economists he had zero to say about how to meet the enormous challenge of measuring productivity in the huge variety of services sector sub-sectors. The UK inflation picture is relatively easy to explain, at least in an accounting sense. The lion’s share of inflation’s weakness is accounted for by external factors – weak world prices and a strong exchange rate. These factors are themselves in part a reflection of weak world demand, pushing down the prices of oil and other commodities. The impact of external disinflationary pressures on UK inflation is thus likely to be persistent. Nonetheless, in time these external pressures should wane. What will then determine UK inflation is the evolution of domestic costs, specifically labour costs. Inflation is not determined by the evolution of domestic costs. Inflation is not a cost-push phenomenon It seems like that if you are a bottom-up, statistics-obssessed, nerd, but monetary economists know better. It is a monetary phenomenon, driven by changes in nominal demand expectations, in that sense it is “demand-pull”. And those expectations are led by the central bank’s monetary policy stance. This is a pretty basic and worrying schoolboy error for the Chief Economist to make. This might help when Milton Friedman responds to a student’s question (about 7.40 minutes in). The UK labour market has been hard to read over the past few years. In common with other forecasters, the MPC has consistently been surprised by the weakness of wages, given the strong cyclical bounce in job creation. It has over-predicted the path of wages in recent years. There are a number of possible explanations for this wage weakness. Chart 30 accompanied this section, and shows just how much ground has been lost through the forecasting errors of the MPC and their fear of incipient wage inflation leading to over-cautious monetary policy targets. Haldane then ran through the usual worn-out excuses of why the MPC has been so consistently wrong (and other forecasters, don’t forget, they are all wrong together so it’s kind of okay to be wrong): more slack than thought; the Philips curve has flattened, maybe due to more technology, maybe due to labour losing bargaining power. He even speculates that labour’s share of the economic pie is not going to mean revert. That would put the balance of risks squarely towards a more protracted undershoot of the inflation target, even without any downdraught from external prices and demand. Uncertainty about demand is, once more, on the rise. Given its source – the third in a triplet of crises, this time afflicting the emerging market economies – I do not expect that rise in uncertainty to be temporary. I expect its impact to be greater in today’s world of post-crisis traumatic stress and could more than offset the cost of capital accelerator, as we have already seen repeatedly since the crisis. Against that backdrop, my view is that the case for raising interest rates is still some way from being made. Whatever the reason, the economic aircraft appears to be losing speed on the runway. That is an awkward, indeed risky, time to be contemplating take-off. Meanwhile, inflationary trends do not at present given me sufficient confidence that inflation will be back at target, even two years hence. For those reasons, I have continued to vote to leave rates unchanged, with a neutral stance on the future direction of monetary policy. Now more than ever in the UK, policy needs to be poised to move off either foot depending on which way the data break. This mysterious thing “demand” keeps getting derailed. This time by some sort of EM shock. It doesn’t seem very clear how an EM downturn can cause a demand shock in the UK, but Haldane is worried. And that’s a good thing because NGDP growth is weakening and NGDP expectations are weak too, so the BoE might do the right thing yet. Even if he can’t understand the power of a central bank to sustain domestic demand, Haldane is sensitive enough to sniff a problem. But he will remain a lost soul, adrift on a boat tossed about by the breaking data, sorry, by breaking waves. He should turn on the engine and steer the ship to a better target than the 2% inflation ceiling. What is it about 2% and the Bank of England? 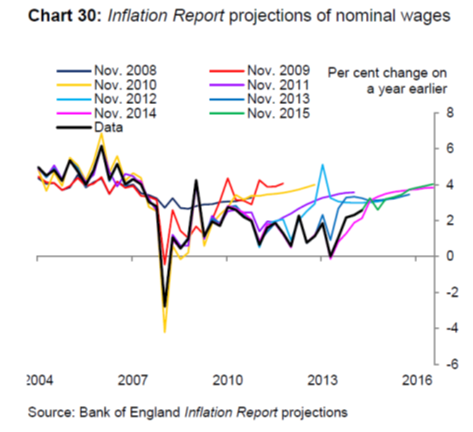 The Bank of England published its quarterly Inflation Report for November 2015 last week. The fact that the BoE is missing its 2% inflation target by more than 1% set in train the usual mini-flurry of letters to and from their political masters at the UK finance ministry, aka The Treasury. While reading the Treasury reply I spotted that there had been an “evolution in UK monetary policy”, I was forced to read on. In fact the gap to the 2% target was back to the largest for some time at a negative 2.12% thanks to the most recent CPI itself coming in at a negative 0.12%. Of course, sophisticates prefer one of the numerous measures of “core” CPI, excluding food and/or energy, and/or housing, etc, etc. Market Monetarists prefer to pay no attention to CPI since it is not a proper macroeconomic statistic, but a political one, since it is never revised. All proper economic statistics have to go through numerous revision processes over time – that is what makes them robust measures of the actual economy. No reliable macro number can be perfect first time. Only faith-based economists look for certainty. The peak effect of monetary policy on inflation is generally estimated to occur with a lag of between 18 and 24 months. There is little recent evidence of 18-24 month lags. US monetary policy immediately crashed the world economy in 2008 after the Lehman bankruptcy. The Bank of England was busy doing the same in 2007 and 2008 with its extremely grudging, and therefore massively confidence-sapping and counter-productive, response to a run on its banks. The ECB immediately crashed the Euro Area in mid-2011 when it raised rates twice. Monetary policy has supposedly been “highly accommodative” as Janet Yellen constantly reminds us, for nearly seven years. It is actually quite destructive of central bank credibility this refrain, and gets repeated by so many really quite smart people. But this supposedly “ultra loose” monetary policy has only engendered the slowest recovery in the post-war years, showing that: a) it hasn’t been very accommodative and b) that the supposed 18-24 month lag are faith rather than being evidence-based. The MPC judges it appropriate to set policy in order to ensure that growth is sufficient to absorb the remaining spare capacity to return inflation to the target in a sustainable manner in around two years and to keep it there in the absence of further shocks. We have already commented on central bankers really targeting the two-year out inflation that their macro models generate, and that these models are based on the false Philips Curve theory: that inflation and unemployment are inversely correlated. These central bankers need to look at the track record of both the Great Moderation and the last seven years, abandon the theory as false, and move back to orthodox monetary economics (that monetary policy determines nominal growth), or better Market Monetarism (that expectations of nominal growth are the monetary policy and thus drive actual nominal growth). In line with the requirements in the MPC remit, your letter provides a clear assessment of considerations and trade-offs guiding decisions from the MPC when considering the appropriate approach to, and horizon for, bringing inflation back to target, including implications for output volatility and risks of possible financial imbalances. The Government’s commitment to the current regime of flexible inflation targeting, with an operational target of 2% CPI inflation, remains absolute. Trying to ignore the humour in an absolute commitment to a flexible policy, there is nothing special about 2%. The figure was plucked out of the air one day by central bankers as an ad hoc number around which to organise their weapons to fight much higher inflation. It worked for a while in bringing down inflation from those higher levels, and helped create the space for the Great Moderation. But Inflation Targeting’s time has come to an end as it has become a ceiling and started to interfere with optimal monetary policy. Monetary policy should be set to secure stable nominal income growth along a trend level, not “inflation”. There would be no disaster if we all just stopped talking about “inflation”. To be fair the Treasury did try to make clear in their letter that the “target is symmetric: deviations below the target are treated the same way as deviations above the target.” I find that a bit hard to believe given the hand-wringing in the commentariat when CPI is above target is only matched by much the same hand-wringing when it is below target but could soon rise above target – according to the false theory in Fallacy 2. That “evolution”: what is it about 2%? As described in the Inflation Report published today, the MPC’s preference is to use Bank Rate as the active marginal instrument for monetary policy, and expects to maintain the stock of purchased assets at £375 billion until Bank Rate has reached a level from which it can be cut materially. The MPC currently judges that such a level of Bank Rate is around 2%. This is a further evolution of the Committee’s forward guidance framework, which included guidance on the APF, originally announced in August 2013. We now seem to have two 2%’s in the UK. The flexible inflation target and now some sort of natural 2% rate of interest at which the BoE can “materially” unwind its Asset Purchase Facility (“QE”) and do more than just not reinvesting proceeds from maturing bonds but sell them off too. Is this really what they talk about at the Monetary Policy Committee? A sort of Fantasy Football League chat about what the future level of interest rates might possibly mean for the economy. Sure, if nominal growth is robust at over 5% and “inflation” bobbing along regularly above 2% then rates might be higher. But why set yourselves up as hostages to fortune and declare that a 2% Bank Rate is the right level to aggressively unwind QE? And why do both the BoE and the Treasury declare this an “evolution” of monetary policy guidance. At the end of the day the rate setters have to talk about something and Fantasy Football League is fairly harmless, I suppose. I think this post by Eric Lonergan may be an attempt at a response to this post here a week ago. This idea can be discussed later, but appears to be an attempt to get monetary and fiscal policy aligned by getting the Bank of England to buy bonds issued by a National Investment Bank, and thus directly finance additional government spending, even if labelled “public investment”. It would probably lead to higher inflation, but the negative multiplier from government investment controlled by Corbyn and his trade union supporters would mean real GDP would not grow much. However, in the reply to my post Lonergan completely misunderstands the call to change the target of monetary policy. Market Monetarists do not call for raising the inflation target. We call for not trying to target something as flaky and hard to measure as inflation, but something much easier: nominal GDP, or aggregate demand (as defined in economics textbooks), measured by one of the three standard methods of nominal income, expenditure or output. As a distant second or third best, raising the inflation target would be better than sticking to a rigid target for inflation. Many successful central banks operate with this policy right now. Lonergan should read up on Canadian, Australian and Swedish monetary policy, at least in the Svensson era. Inflation falls if there is significant spare capacity. If the central bank can consistently hit its inflation target there is no spare capacity. If there is no spare capacity, there is no policy problem. There is only a problem if inflation is below target AND the central bank cannot raise the inflation rate. If the central bank cannot raise the inflation rate, and inflation is below target, it cannot hit a higher inflation target. The premises start badly and get worse. “Spare Capacity” is a red herring for a good monetary economist. The spare capacity (or gap) theory of inflation is not true. You can have high inflation unemployment and low inflation unemployment. Inflation is a monetary phenomenon in the long run, not a real one. The Phillips curve has been discredited for a long time now. It is surprising to still hear it from such an expert on money – although not surprising given many central bankers seem to share this illusion too. The second premise is confusing. The central bank can hit its inflation target if it wants to, but has to convince the market that it wants to through credible action or threats of it. Constant fears of tightening every time the target is approached means the target will not be hit. Many modern central banks consistently defeat themselves, see the Fed or the UK nowadays, or Japan for many years until recently. The third premise is problematic. Spare capacity is almost impossible to measure. We can see it obviously when unemployment is high, but when it is low and the participation rate is low (the US now) – who knows? Probably there is spare capacity, and a lot of it. Is there spare capacity when you have low unemployment, decent participation levels, but lots of low paid gigs, many with tax credits attached, zero hours contracts and a constantly growing labour force size due to inward migration, like the UK? Who knows, probably yes. The fourth premise does raise a problem. If central bankers are just not doing their job properly then we need to sack them and get in ones who will do the job – just like any employee who constantly misses their targets. The Japanese government has shown it can be done without causing instability and has had decent success following the change – as unemployment has fallen and inflation ticked up. Japan needs to do more, but they have shown good determination. The fifth premise is just a truism. The “sort of” opposition of Lonergan and other left wing bloggers (Wren-Lewis, Coppola, De Long and Yates) have to changing the inflation target or moving to nominal GDP targeting remains mysterious to me. Sometimes, they write in sympathy, even Longeran, sometimes not. I think mostly this is because they want to see more government, they are left-wing after all, whereas Market Monetarism is politically neutral – even if I am a self-admitted supply-sider. Either way, we need good strong real GDP growth to pay for those less successful via welfare or via offering them decent jobs. NB The “market” in Market Monetarism is for market expectations of NGDP growth to be the target of monetary policy. Constant, predictable, nominal growth should be the object of central bank policy.